Sterling silver tube beads are the perfect spacers for larger size beads. 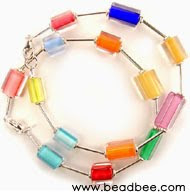 They provide a more modern look and will allow the gorgeous beads that you pick to stand out in your jewelry. In this example, I used a sterling silver heishi bead on each side of the glass beads for added detail. This piece was strung on medium weight Flex Rite beading wire and finished with a simple lobster claw clasp.